Free Credit Score Canada with No Credit Card Required! Obtain your Canadian Credit Score for Free! I’m sure most readers are aware of the American credit card market is much hotter than in Canada, among other things. I wrote about that in my basics on credit card churning, and also the difference between the Canadian and American credit card market. Your credit is one of the most important parts of being able to acquire miles and points, because you can easily earn tens of thousands of points from credit card signup bonuses. You don’t even have to be into advanced credit card churning. For example, getting the TD Aeroplan Visa Infinite with an increased 25,000 miles Aeroplan signup bonus and waived first year annual fee, as well as the American Express Gold Card also with a 25,000 mile offer and first year free will get you a one-way business class ticket to Europe. One fairly importance difference is acquiring your credit score, determining to an extent whether you’ll be approved for a card. You can get a free copy of your credit report from the two major credit reporting agencies, Equifax and Transunion. That will list all your accounts and their statuses, but there’s no way to get a free credit score in Canada. Or so I thought. Want a free credit score Canada? You can get one thanks to the Home Depot data breach a few months ago. 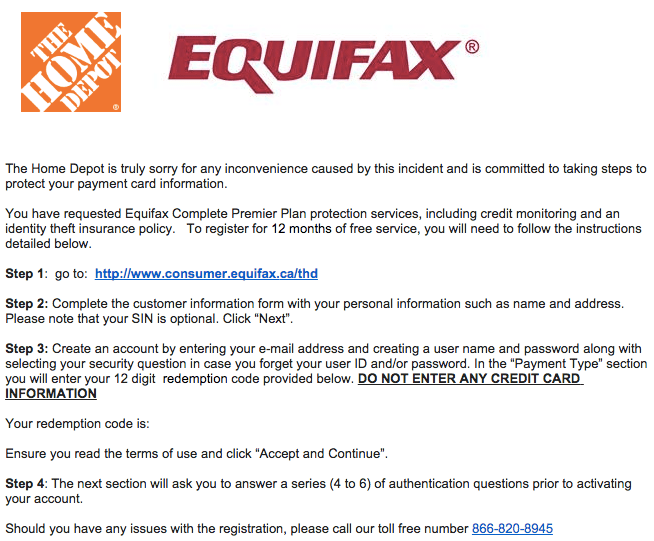 Last year, Home Depot Canada suffered a data breach of their credit card information. 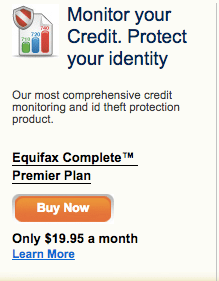 As a result, they are offering customers access to their credit score as well as free credit monitoring with Equifax. This was only for those who’ve used credit cards at Home Depot, but there’s no verification process to establish that you were actually a customer. Everyone should be able to signup. Home Depot will provide you with a voucher code that you can enter on the website that will waive the fee for the Equifax Complete Premier Plan, which normally costs $19.95 a month. You won’t even have to put your credit card information in. You’ll then be able to check your credit score and see how it’s affected when you’re applying for credit cards. The deadline to get a code is March 31, 2015. For more information, see the website Home Depot set up for this. Hopefully, everyone can know their credit score for free! Thanks for the tip! Keep them up! Thanks for the info. you can register for the free monitoring up until Sept 19/2015!! I and my wife immigrated to Canada 7years back and we have two credit cards each and we pay all our bills on due dates through pre-authorized debits. Our credit card balances are paid in full on the due dates automatically through debit setups from our chequing account. I utilize my credit card more than my wife and the bank has increased my limit 5 times in 2 years. We utilize about 20% of our credit limits. We have not defaulted a single credit card or bill payment. All the phone, internet, newspaper, insurance etc. are in my name. My wife has only the two credit cards to pay. We do not have a mortgage or car loans.